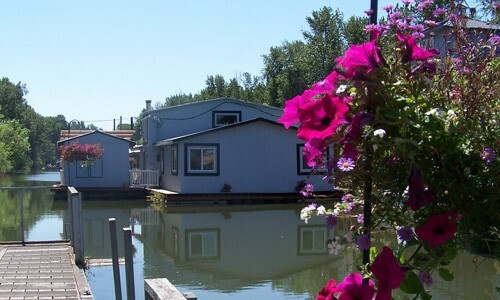 Kadow’s Marina is located just north of Vancouver, Washington, near the Columbia River’s Washington shore behind Caterpillar Island (a mile-long sandy beach with cottonwood trees). Along this stretch of quiet water lies a unique neighborhood of eighteen floating homes moored near a wildlife refuge and eight miles from gas or groceries. It is here that you have the opportunity to see beavers swimming by and otters playing. You’ll witness bald eagles soaring and blue herons nesting. Contact us today about boat slip moorage availability. Parking: Courtesy parking is provided by the Washington Department of Fish & Wildlife (WDFW) in the lot across the road from the Marina. The State of Washington requires that a “Recreational Use Permit” be displayed in each vehicle. Parking lots are periodically patrolled by WDFW and fines for non-compliance are assessed. Storage of vehicles, trailers, etc., is strictly prohibited. Five-minute parking for loading and unloading is available at the top of the main ramp. Under no circumstances are boaters allowed to use parking spaces on the river side of the road. Non-compliance will result in fines and/or towing at the owner’s expense. Carts: The Marina provides carts for tenants and boaters to use to transport belongings. These carts are located at the bottom of the main ramp. Carts must be returned to the main ramp after each use so others may use them. Boaters who do not return the cart before leaving, either by boat or vehicle, will be assessed a fine. Riding in carts is strictly prohibited. Life Jackets are required for all children and non-swimmers. Children must be supervised by an adult at all times and are not allowed to run on the docks at any time. Speed Limit: There is a 5 mph speed limit for all boaters in the channel along the Marina. Boat wakes can cause damage to houses, floats and boats in slips, weakening tie-ups and causing docks to break loose. It is in the boater’s best interest to assist in enforcing this rule. River Surges: Boaters are responsible for securing their boats to the dock. Because of the Marina’s location, powerful surges are experienced throughout the day as ships enter and exit the Ports upstream. Boaters must beware of surges and give warning to all visitors of the danger of being crushed between houses, docks and boats during a surge. Also be aware of rotten boards or boards working loose due to surges or other movements on the water. All dangerous situations must be reported to management immediately. Live-Aboards: Kadow’s Marina does not allow live-aboards. Occasional overnight stays are acceptable if the Marina is notified in advance. Without proper notification, legitimate boaters may be ejected as intruders during nighttime patrols. The Marina curfew is 10:00 pm. Wildlife: Kadow’s Marina is located on a Wildlife Refuge. Intentional destruction of wild animals and birds is unlawful and strictly prohibited. Wooden Boats: Kadow’s Marina is no longer renting slips for wooden boats. All boats must come in under their own power and be in good operating condition. Any boat towed in will be accepted only upon Lloyd Kadow’s approval. Security: Kadow’s marina is proud to have the latest electronic surveillance camera systems providing 24-7 security. With nearly fifty “state of the art” day and night vision video cameras covering every entrance and exit by water or by land, including parking lots as well as nearly every slip, you can be sure that your boat and gear are safe as we can make them.